I stitched around the basic paisley some more and completed this piece. Beaded half buttonhole wheels completes this paisley. I was itching to do this stitch. 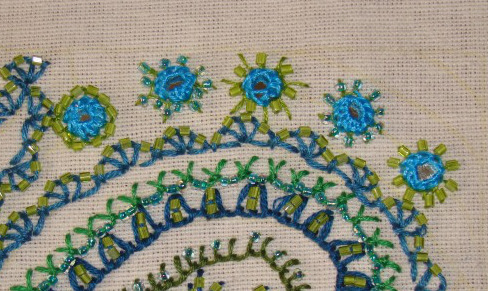 Tiny mirrors were positioned first and beaded buttonhole stitch variations were worked around them in this part. The mirrors were stitched with blue thread. Sequins were stitched instead of beads in this part of the piece. Not all that impressive is all I can say. Too much bling I suppose. This part is done with buttonhole filling. Each row goes around the bead in the previous row. I thought this idea may not be very good. But surprised to see that it is looking good. 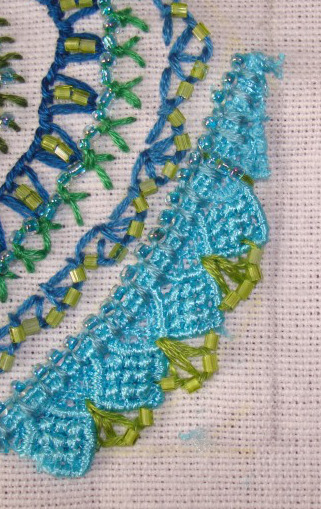 Lace was attached with blue thread and blue beads. Beaded quarter buttonhole wheels were added with green thread. After the uncertain and anxious start, I started enjoying working on this piece. Instead of keeping this as a sampler, it can also be used on some other project. Too excited to think about it now. Each and every step I felt happy having taken SharonB’ s online class. I worked another outline on this beaded buttonhole paisley design. 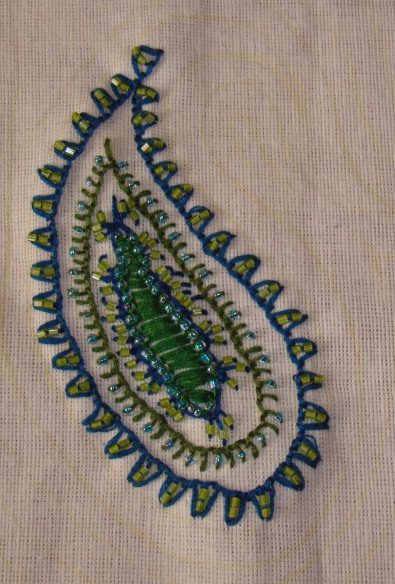 This outline is up and down buttonhole stitch in green thread with blue beads. Slowly this work is becoming interesting. Till now, my variations have been done as 4 inch samples. I love the way the colours and beads are working together on this design. Paisleys always fascinate me. Another outline is required on this shape. 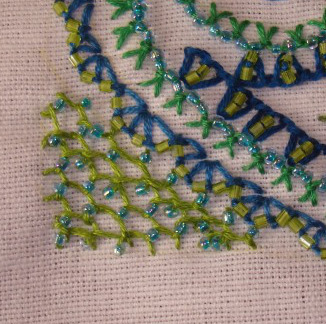 Another beaded buttonhole stitch outline was done yesterday. 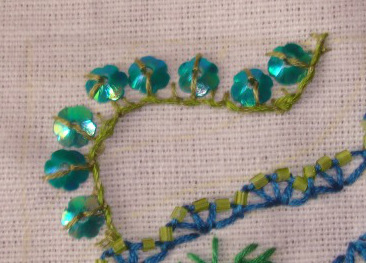 This is closed version of buttonhole stitch in blue thread with two green beads inside it. 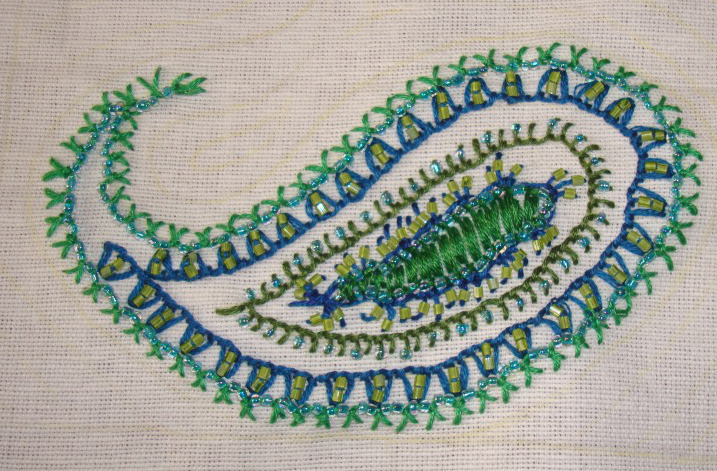 Though I have embroidered on curves before, I am yet to relax working on designing with stitches and colour study. My mind keeps jumping ahead to visualize the final effect, and the hands are not fast enough, they also get sloppy with anticipation. I wish to loose this feeling of inadequacy soon. That is the reason I started working on designs for TAST stitch challenge. 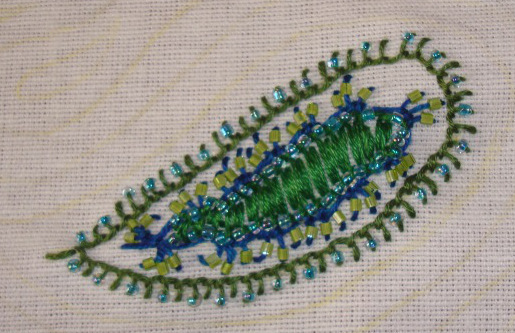 The working of this stitch is on SharonB ‘s blog. I am slowly moving out of regular band samplers of TAST stitches. 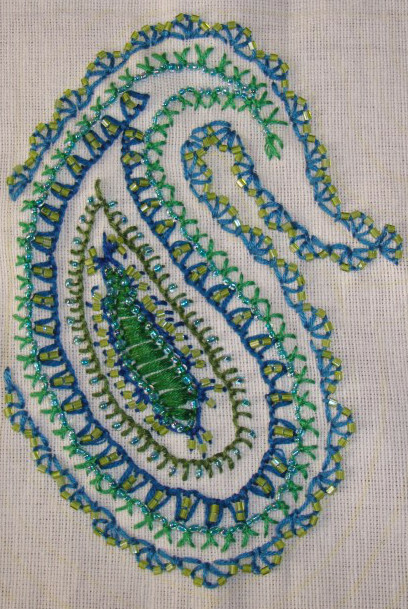 The idea is to work the variations of this stitch on a paisley shape. Three rows are worked till now. I started with the outer line- alternate buttonhole stitches are beaded. Then in the inner line, beads are worked with blue thread on three buttonhole stitches together. 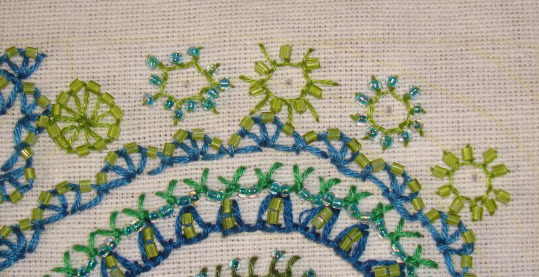 The centre shape is worked with beads in green thread on the upper side, with buttonhole stitches worked on both sides filling the centre. Thinking about working two more lines around this shape.